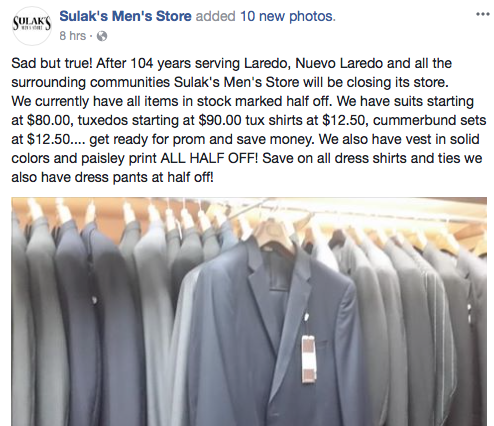 Sulak's announced last week on their Facebook page that they're closing up shop. I wasn't a regular patron of this downtown institution. I did buy a suit there a couple of years ago as a Father's Day present to myself. Yet another nail in the coffin for downtown. 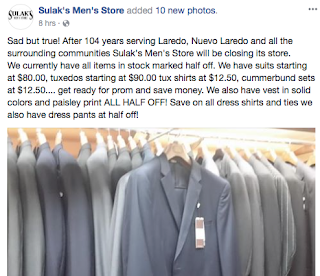 So long, Sulak's. 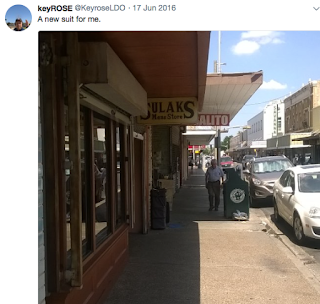 Although there are many factors contributing to the death of Downtown Laredo, our worthless city officials are completely complicit in its demise. Without a doubt, this is the worst administration and council since Laredo went to eight single districts. District 8 un-representative Roberto Balli is a worthless piece of garbage who knows absolutely nothing about business or downtown Laredo. His only goal is to completely kill off the few downtown merchants that are still left. His only agenda is to collude with his fake MMD Board and other downtown entities (an architecture firm and a certain hotel) that receive every single city contract in an attempt to absolutely fleece the local tax payers. And, he is getting away with it unabated especially since our Mayor is completely worthless as well. Mayor Saenz ran for the position with the promise of fighting corruption and forming a transparent city government along with revitalizing Downtown. He has failed miserably at everything he promised. Not only has he completely failed, he runs around like a scared little girl worried about offending anyone or standing up to our useless and corrupt council members. I have heard him described as “spineless” in this blog, while many prominent local business leaders have publicly called him out for his absolute lack of leadership and business savvy. So apparently, that will be Mr. Saenz's (and the current city councils) legacy, the mayor and administration who finally killed off Downtown Laredo. They should all be very proud!